Could it be true? Lauryn Hill making her first musical debut in the last 10 years? Yep, its true! 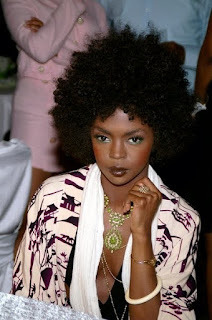 Lauryn Hill recently ranked the #94 spot on the Billboard Hot 100 charts, with her new single "Repercussions". Last we heard from Lauryn, in regards to new music, was 1999 with the single "Turn Your Lights Down Low" feat. Bob Marley. Her last album was 1998, the INFAMOUS "Miseducation of Lauryn Hill". This album earned her 10 grammy nominations, and of those 10 she took home 5 grammys!!! Fans have been holding on to this album and begging for a Lauryn Hill comeback. However, there were a few attempts on her behalf. She states the timing was just not right. She lacked the proper support system (Lauryn is the mother of 5, her youngest being 2 years old) & she had to experience some personal growth before returning to the industry. Well, now she is here!!! Listen to her single, "Repercussions" and decide if its been worth the wait. The lyrics, " Talking about the things we do. Things sure can come back to you. What goes around comes around. ", are indeed about repercussions for your actions. Check it out! !